How does art-historical amnesia work? What are the impulses for so-called rediscoveries? What are the half-lives of selection and canon formation? What social and cultural factors are complicit in specific cases of forgotten artists and their works? A pool of perspectives from art history, sociology, and cultural policy seek to trace down such complex mechanisms, with a focus on some aspects of the more recent past and present. Both Poland and the territory of the former GDR have in many ways a similar history – at least with respect to the situation of visual arts over the last three decades. 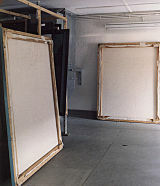 In both countries, the development of contemporary art and the theory formation associated with it were, until 1989, frequently influenced and restricted by ideologies. But beyond widespread stereotypes they also led to interesting anomalies and creative jinks. Many of these artistic strategies and their protagonists are wrongfully forgotten today – the social changes of the late 1980s often resulted in an instantaneous, strong orientation towards dominant Western trends. Focussing on patterns of reception and communication of art, “The Mechanics of Oblivion” seeks to examine how oblivion and marginalisation have come about to this very day, not only in times of upheaval. Artists from both countries as well as sociologists and art experts will have their say. Be it on concrete art or realistic figuration, dry conceptual art or feminist topics – as the discussion keeps going, reassessments and surprises are in the offing. After major survey exhibitions and ambitious research projects that sought to examine a larger portion of the areas of transformation in Central and Eastern Europe, this project aims at a close-up view of two neighbouring regions. 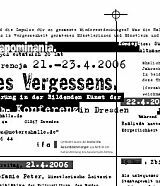 A publication containing articles of all conference contributors will be published in November 2006.